In New York City, a lot can happen in a day. So discover the characters in this exquisite debut novel by Richard Kramer (writer for My So-Called Life). Teenaged Wesley’s family is quintessentially new New York. He’s ensconced in a prestigious prep school and splitting outside time between the two apartments of his happily broken home. The new semester finds Wesley with his prodigious father, Kenny, an in-demand LGBT lawyer with whom he’s meant to be forming a normal relationship. In Kenny’s frequent absence, Wesley instead finds himself bonding with George, Kenny’s long-term boyfriend, and assisting his eternal best friend, Theo, with his student government campaign. Theo’s spontaneous decision to come out during his victory speech forces Wesley to confront the probable facades in his outwardly privileged life—particularly after Theo passes through him a question for Kenny and George. Is orientation a choice? Wesley’s hesitant inquiry triggers a round of introspection in all of those closest to him. So begin probes of otherwise avoided subjects: of intimacy and desire, of prejudice and acceptance, of privilege and marginalization, and of what constitutes a family. The general security that Wesley’s diverse clan had otherwise taken for granted becomes obsolete when Theo and Wesley are viciously attacked after school. The aftermath finds a family in tumult, forced to redefine themselves from the foundations up. 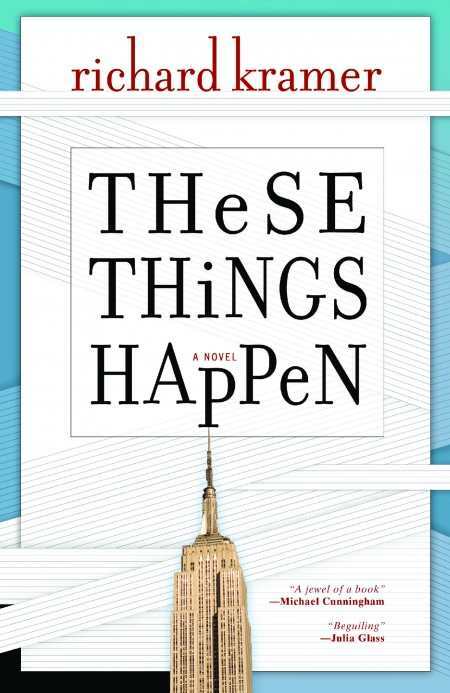 These Things Happen is greater than the tactility of its descriptions and the tragicomic vivacity of its characters. This is a novel of the sort that defines generations. Weaving together the individual struggles of his various characters with profound empathy, Kramer asks the reader to consider the limitations of genial political correctness, and even the very notion of love. That Theo is able to transition from closeted to openly gay without being rejected by anyone in his immediate circle represents progress; that, after a decade together, George and Kenny still feel obliged to engage in self-negation amongst others reminds us of the lengths left to travel. Still, Kramer’s characters tackle their social confines with remarkable alacrity and, where appropriate, the right measure of regret. Beauty and tragedy, adoration and resentment perch simultaneously on single sentences, and readers will be hard-pressed to resist the resultant emotional pull. If, as Wesley muses, “everything is practice for conversations that haven’t happened yet, with people [we’ve] yet to meet,” then wandering the pages of Kramer’s novel may be a crucial warm-up exercise for us all. A dazzling tour de force, alternately exhilarating and devastating, and, at all turns, revelatory.